Luck has been with me the past couple weeks as I've received or found a lot of books from my wishlist. Infernal Devices by K.W. Jeter - I've been looking for a copy of Infernal Devices for quite some time, but I finally tracked a used copy down of one of the original Steampunk stories written by the man who coined the term. The Mount by Carol Emshwiller - I kept hearing about this really crazy book in which aliens have taken over earth and after a century of occupation now use humans as transportation much like we use horses. My friend Comicaze somehow bought two copies without realizing it and gifted the extra copy to me. I read Emshwiller's The Secret City a couple years ago and found it to be quite a twisted take on crash landed aliens. Clementine by Cherie Priest - This long novella is in Priest's Clockwork Century world and will be released by Sub Press in May. It picks up a subplot from Boneshaker with some of the same characters and I'm dying to dig-in, but since it is a few months away from release I'll hold off for now. 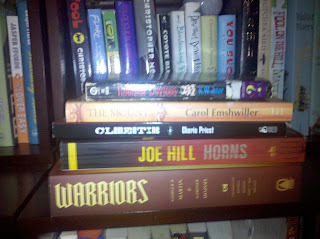 Horns by Joe Hill - Here is one I've mentioned a couple times. I was lucky enough to win one of the galley's Publisher's Weekly had up for grabs of this highly anticipated February release. The ARC was actually done with a cool metallic finish so maybe my earlier thoughts on the cover are a bit unfounded. Sometimes the final in-person cover can look leaps and bounds better than online. Warriors edited by George R.R. Martin and Gardner Dozois - Featuring a new Dunk and Egg story is pushing this to the top of my to-read pile, but first I'll be re-reading the two prior installments stories in the series since I need to reacquaint myself with the characters. But even without that story it still longs to be an incredibly strong collection, which releases in March. The Bookman by Lavie Tidhar - Not pictured as it just came today. This is from BookDepository.com as part of a large order that will be coming in over the next few months of some books I just had to have mostly comprised of books with no US publication date in sight.